By John Halksworth, et al. Your cost-effective online language lab, accessible anywhere, anytime Exclusively endorsed by AQA, this course provides an integrated learning package, directly meeting the needs of learners preparing for the 2009 AQA GCSE Spanish assessment, and teachers delivering the new syllabus. 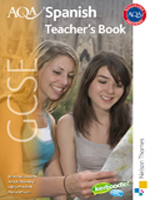 Guidance notes and answers for all activities in the student book, presented in the same order as the student's book. Additional starter and plenary activity ideas for each teaching spread. Transcripts for all listening activities from the student's book. A section on how to work with our Controlled Assessment tasks in the student's book, plus notes on Controlled Assessment delivery and marking.